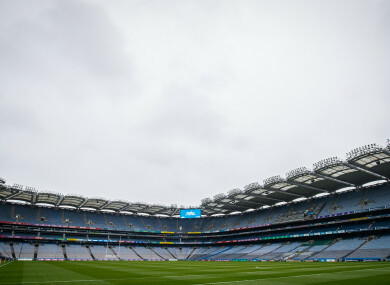 CROKE PARK WILL host the 2019 Division 1 league finals in football, hurling and camogie next Sunday 31 March in a unique triple-header. The GAA confirmed the league final arrangements after today’s final round of football fixtures and the hurling semi-final ties in Nowlan Park. The football decider will see Kerry face Mayo at 4pm in Croke Park with Limerick taking on Waterford in the corresponding hurling fixture at 2pm. The first match of the day will be the Division 1 camogie decider featuring Kilkenny against Galway at 12pm. The Division 2 and 4 football league finals have been pencilled in for Saturday at Croke Park with Derry facing Leitrim at 3pm and then Donegal taking on Meath at 5pm. The situation in Division 3 is unclear with the Round 6 fixture between Louth and Westmeath now having to be played next Saturday afternoon in Drogheda at 2pm after it was postponed last weekend. Laois are already promoted with a win for Louth seeing them make the jump while Westmeath require a win or a draw to ensure promotion. Email “Croke Park triple-header next Sunday for football, hurling and camogie league finals”. Feedback on “Croke Park triple-header next Sunday for football, hurling and camogie league finals”.